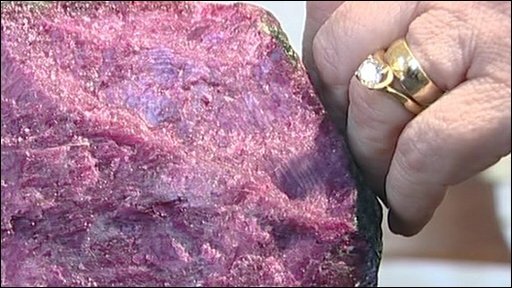 A giant ruby once thought to be valued at £11m and used to support an insolvent Shropshire construction firm has been sold for £8,000. The "Gem of Tanzania" was entered as one of Wrekin Construction's assets in 2007 to help prop up its balance sheet. In 2009 it went into administration when the Royal Bank of Scotland withdrew its services. It then emerged the stone's valuation had been forged. Administrator Ernst & Young said it had more than 60 offers for the ruby. Ernst & Young declared the 2kg (4.41lbs) stone's £11m valuation and its accompanying documents a forgery in 2009. At the time Wrekin Construction's managing director David Unwin claimed he had been the victim of a third party valuation fraud. He said: "I believed it [the stone] to be worth a lot more when I bought it." The stone previously belonged to Tamar Group, a parent company of Wrekin Construction that was also owned by Mr Unwin. It had been entered in Tamar Groups accounts with a value of about £300,000, yet 12 months later when it appeared on Wrekin Construction's balances it had an £11m valuation. A BBC Inside Out West Midland's investigation found that Mr Unwin had a 12 month suspended prison sentence for theft from finance companies in 2002 and had previously run 30 other firms that either went into administration or were liquidated. Wrekin Construction, based in Shifnal, Shropshire, made 420 people redundant at its plants in Shropshire, Yorkshire, Northamptonshire and Cheshire when it went into administration in March 2009.